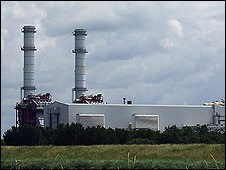 Plans have been announced for a £500m expansion of a gas-fired power station in Lincolnshire. The new plant would match the output of the existing one at Spalding, producing a total of 1.8 gigawatts - enough to supply the needs of two million homes. The company behind the plan, Intergen, said the expansion would create 600 construction jobs and about 30 full-time positions. An exhibition is being held in the town until Saturday to gauge local opinion. Station manager Paul Hanson said: "Spalding is a good place to do business, we have excellent relationships with the Spalding people and the Spalding businesses, we have an excellent connection to the national grid and we have a good connection to the gas network. "This area is ideal for an expansion of this sort." South Holland District Council said it would wait for firm proposals to be submitted before forming an opinion. The new power station would take about three years to build.